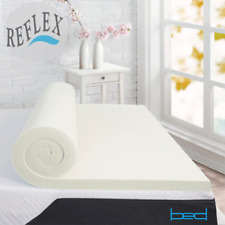 100% MEMORY FOAM MATTRESS TOPPER AVAILABLE IN ALL SIZES & DEPTHS 1" 2" 3"
MEMORY FOAM MATTRESS TOPPER SINGLE DOUBLE KING SUPERKING 1" 2" 3" 4"
Size: Double. RRP £39.99. Made and manufactured in the UK. 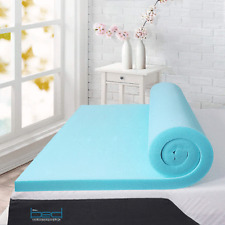 Memory Foam Toppers - Cool Blue, Memory Foam, Reflex Foam 1" - 2" - 3 " 4"
Give your mattress new life and love your bed again when you add the orthopedic foam mattress topper. Adding this mattress topper is the easy and practical way to upgrade your sleep experience. Orthopedic foam remakes your mattress by adding an extra layer of cushioning with 5 zones that give each area of the body proper support. 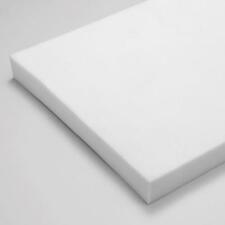 Give your mattress new life and love your bed again when you add the orthopedic foam mattress topper. Adding this mattress topper is an easy and practical way to upgrade your sleep experience. Orthopedic foam remakes your mattress by adding an extra layer of cushioning with 5 zones that give each area of the body proper support. Density so that it will last for years without losing shape. Soft surfaces are not intended for infants and young babies. Travel savvy – features a unique Roll-N-Carry feature for maximum ease when traveling with it or storing. 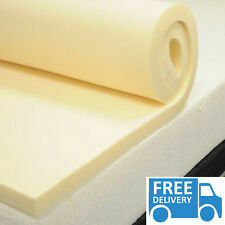 Orthopaedic Hypoallergenic Memory Foam Mattress Topper - All Sizes & 1" 2" 3" 4"